Last week I tuned into a press preview of today’s Lenovo announcement. It was an online presentation so, you know, I went on and did other things while half listening. I was nearly ready to close the tab after listening to 20 minutes of some product manager explaining every little detail about the consumer-oriented IdeaPad K1 Honeycomb tablet. All he really had to say was, “We made a Honeycomb tablet. It’s the same as the rest besides it ships with Netflix. It has 32GB of storage and ships in August for $499.” That’s all I need to report as well. But then the presentation went to the ThinkPad tablet and I woke right up. This is the Android tablet the niche market has wanted all along. The ThinkPad tablet is like a legitimate dream tablet. It has nearly everything a person would want in a Honeycomb tab: an affordable digitizer pen, 2GB of cloud storage, a ton of built-in 3rd party apps, and a 1280×800, 16:10 IPS screen covered with Gorilla Glass. There’s an SD card slot, dual cameras, mini HDMI out, USB 2.0 host, micro USB port, and a SIM card slot. Lenovo states the Tegra 2-powered tab can run with WiFi enabled for 8 hours. The ThinkPad Tablet is built for enterprise and so security and encryption are throughout the whole system including SD card encryption, lost device disablement and anti-theft software. The tablet ships with McAfee and features layered data security. All this amounts to a tablet with proper data protection whether the owner needs it or not. Lenovo seemingly built this tablet differently from other Honeycomb tablets. It’s not a closed device with limited connectivity options. There are multiple ways to get files onto the tablet. Each ThinkPad tablet has 2GB of cloud storage and there’s a built-in Windows 7 file copy and syncing tool. Then there’s of course the full size USB host and SD card slot. The only major missing feature is the Netflix app found in the consumer IdeaPad. Still, the ThinkPad is loaded with a long list of included apps including but not limited to: Facebook, Twitter, AccuWeather, Kindle, Documents to Go, Zinio E-Mag, a ton of games, and of course, the whole Android 3.1 suite. 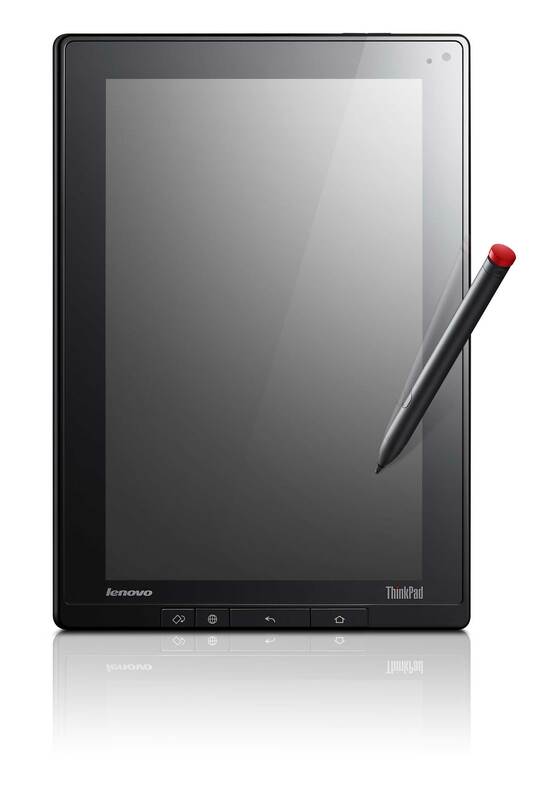 The ThinkPad Tablet, being part of Lenovo’s business-oriented line, is it’s dressed as such. It carries many of the design cues found on the ThinkPad notebooks like a satin black casing, clean lines and a no-frills design. The digitizer pen even has a little red cap just like the ThinkPad’s trademark mouse nub. The ThinkPad Tablet will ship within the US next month with pre-ordering starting on August 2. The 16GB WiFi model is priced at $479 sans digitizer pen and $509 with it. The 32GB model runs $589 and ships with the digitizer pen. 3G models are on tap, but Lenovo didn’t announce the prices or release dates. Lenovo clearly concocted the ThinkPad Tablet from a different formula. It’s priced right, has compelling features, and is a solid step in the right direction. Hopefully the ThinkPad doesn’t disappoint in real life because the specs read like a dream.